On this Federal Holiday, I was not protesting that #BlackLivesMatter or volunteering for the day. I was in California’s Central Valley enjoying the weather. I was celebrating my birthday a little early by going to brunch. If you’ve ever gone to brunch in the Bay Area, you’ll know that it is serious business and people will wait for hours to eat waffles. It’s crazy, I know. At this brunch spot, I was sitting down outside, waiting for my name to be called. I looked around and realized that my family was the only family of color at the entire restaurant. On either side of my family were White couples, just waiting to get their hands on warm food. Then it struck me, sixty years ago, I wouldn’t have been able to sit in the same waiting section as the people around me. I would have likely had to sit in the back, and use a separate entrance to enter the restaurant. Sixty years ago, I would have had to eat in a separate section if the restaurant had allowed us to eat there at all. 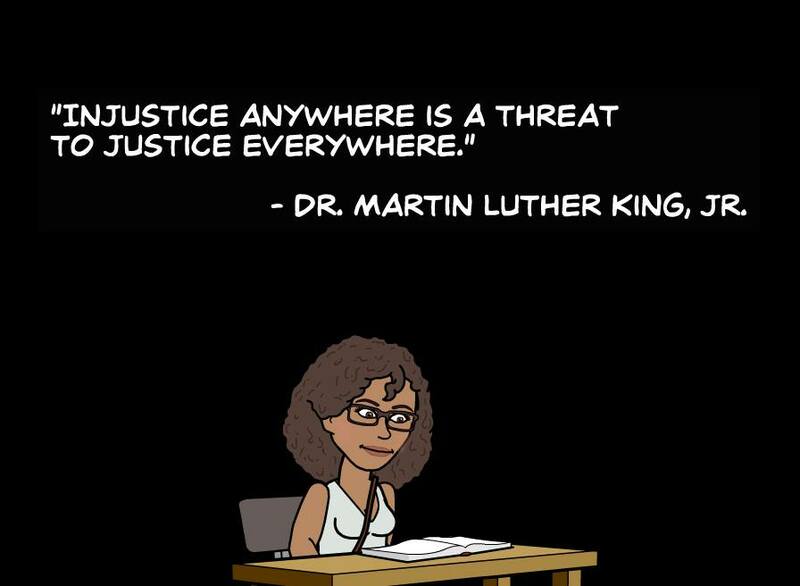 Cartoon Ebonye, reflecting on MLK Jr’s words. My best guess is that the people around me were not thinking these thoughts, because they’ve always been able to sit down wherever they like and eat breakfast. To other people, sitting down at any restaurant they please is just a normal thing. And for some people, it’s always been a normal thing. Sixty years ago, my grandmother wouldn’t have been able to do the very simple thing that I was doing, at least not in the way I was at that moment. When I’m on a bus, I choose to sit as close to the front as possible, because I know that I can. People who I may never meet have suffered many indignities and pain just so I can walk into a Starbucks and order a latte, or fly on an airplane, or use a public park just like any other American. Today, I chose to be grateful for the small victories. Even though there is still much progress to be made for racial relations, this is one battle we don’t have to fight anymore.